Peasgood's Nonsuch is a good-looking traditional English cooking apple from the Victorian era. As the name suggests, it was raised by Mrs Peasgood of Stamford, Lincolnshire - probably in the middle of the 19th century. Peasgood's Nonsuch has all the qualities expected in a traditional English cooker - large size, plenty of juice, and a sharp tangy flavour. The coarse light flesh readily cooks down to a puree. The apples ripen mid-season and can be kept for a few weeks, filling the gap before the late-season cooking apples become available. As well as being one of the better English cookers, in Victorian times it was also considered a good eating apple as well. Please fill in the details below and we will let you know when Peasgood's Nonsuch apple trees are back in stock. 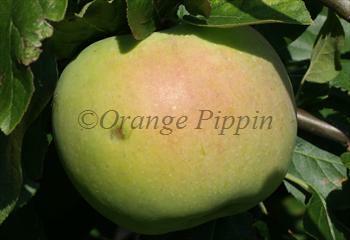 Peasgood's Nonsuch is in flowering group 3. Peasgood's Nonsuch is partially self-fertile, but fruiting will be improved if there is a compatible tree of a different variety nearby. 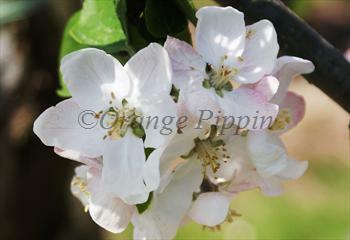 Since it flowers in the middle of the blossom season it can be pollinated by most other apple trees. Peasgood's Nonsuch (also known as Peasgood Nonesuch) was probably raised in the middle of the 19th century. It received a first-class certificate from the RHS Fruit Committee in 1872, and soon became a popular garden variety. The term "Nonsuch" is seen in several apple variety names, and had a more favourable meaning in Victorian times than it sounds today. The French form of the same word is "sans-pareil" or "non-pareil", and is also found in several old English apple names. When translated this gives the true meaning of "non such", i.e. "unsurpassed". The parentage is not known, however it is a parent of another well-known English cooker, Reverend W. Wilks.